Found in FNA Volume 8. Treatment on page 305. Mentioned on page 302, 303, 306, 309. Herbs, annual or perennial, not succulent, glabrous; resin canals usually present. Rhizomes absent; roots fibrous or a taproot. Stems erect or ascending, simple or branched. Leaves cauline, opposite, alternate, or whorled, monomorphic; petiole usually absent; blade usually ovate to elliptic or lanceolate, base mostly rounded to cuneate (or slightly cordate), margins mostly entire, sometimes minutely crenulate, usually slightly revolute, apex acute to obtuse or mucronulate, surfaces glabrous. Inflorescences usually axillary in distal leaves, solitary flowers. Pedicels present or absent. Flowers: sepals (4–)5, green, calyx lobes lanceolate, much longer than tube; petals (4–)5, corolla white to pink, red, salmon, or blue, salverform (almost rotate) to slightly campanulate, lobes longer than tube, apex rounded or truncate; stamens (4–)5; filaments connate proximally. Fruits capsular, globose, 1–7 mm, dehiscence circumscissile. Seeds 5–45, dark brown to reddish brown, angled, papillate to alveolate. x = 10, 11. North America, Mexico, West Indies (Jamaica), Central America, South America, Eurasia, Africa. Species ca. 20 (4 in the flora). Anagallis tenella (Linnaeus) Linnaeus, the European bog pimpernel, was reported in the late 1800s from Saint Pierre and Miquelon; it was most likely a waif and is not included here. It can be distinguished by its perennial habit, procumbent stems, and pink, funnelform corollas. Anagallis foemina Miller, the European blue pimpernel, has been reported from western states; these reports are all based on blue-flowered forms of A. arvensis (see discussion there). Manns, U. and A. A. Anderberg. 2007. 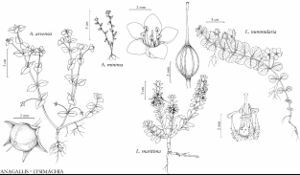 Character evolution in Anagallis (Myrsinaceae) inferred from morphological and molecular data. Syst. Bot. 32: 166–179.